After previewing your survey in Survey123 Connect, but before you deploy it, you need to publish it. Select the survey from the Survey123 Connect gallery. Sign in with your ArcGIS named user credentials. Click the Publish button . A feature service is created to represent your form. If your form contains repeats, separate tables are created in the feature service for each repeat. Your form is saved as an item in ArcGIS Online or ArcGIS Enterprise. Your survey is now available for download and use in the Survey123 field app. Your survey is composed of two parts: the form item that the app downloads and the feature service that contains the data submitted from the survey. It's possible to edit a survey and republish it without deleting the feature service. Most changes to your survey will allow you to republish your survey without deleting and re-creating the feature service. Only the form item will be updated. The following table describes the changes that can be made to a published survey that should not cause loss of data. N/A denotes a feature that is unavailable to add to the survey in this environment and cannot be changed at all. Image and audio questions cannot be added unless there is already at least one or the other in the survey. If you do not already have an image or audio question, you first need to enable attachments to the feature service in your organization. Named note questions require a field in the feature service. Prior to Survey123 2.5, notes that had a name but did not have a calculation or default value didn't automatically generate a field in the feature service on creation. If you republish a survey that contains a note question with a name, but with no calculation or default value, you will be warned and given the option to add fields when publishing. Notes without a name are ignored by the feature service. Note questions with a name can also be omitted from the feature service by setting bind::esriFieldType to null. Renaming a question creates a new field in the feature service under the new name. The old field is retained in the feature service, so on republishing it is recommended that you review its contents and either copy the data to the new field or delete it. In all other cases, republishing your survey will still update your form item but will delete and re-create the feature service. When attempting to republish, Survey123 Connect will alert you if any of the changes you've made cannot be supported by the existing feature service. If you want to make any of these changes, the original feature service will be deleted and replaced, with all associated data lost. Before replacing an existing survey, make sure all unsent surveys have been submitted, and consider downloading the results of your original survey first. In both cases, Survey123 field app users will need to download their survey again to see and work with the latest version. Create coded value domains from choices is on by default. If on (green), the choice list for a question will be used to create coded value domains in the feature service. Turn this off (red) if your feature service already has coded value domains for this service that aren't the exact choice list in the survey. 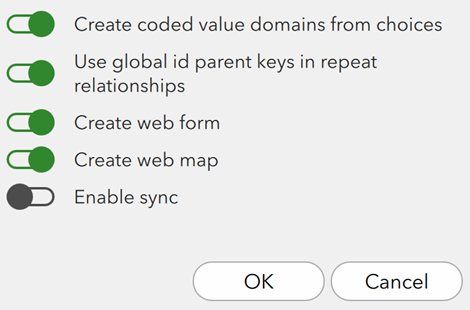 Use global id parent keys in repeat relationships is on by default when publishing to ArcGIS Online and off by default when publishing to ArcGIS Enterprise. If relationships in your feature service are based on global IDs, this option must be on (green) for your survey to function. Create web form is on by default. If disabled, publishing your survey will not create a matching web form to allow users to fill out your survey on the web, meaning that the form will only work on the field app. This option may be required when publishing surveys with functionality not supported on the web (for example, Spike integration), or to circumvent specific publishing errors related to web forms (for example, a choice list with over 4,000 choices). The Settings tab for your survey in Survey123 Connect provides options to control how users can interact with content already submitted to your survey. After submitting a survey response, it is saved on the user's device and listed in the Sent box for the survey in the Survey123 field app. From there, it can either be resubmitted or have new surveys created from previously submitted data. By default, access to the Sent box is enabled, meaning all submitted surveys will be saved on the device for later use. The Sent Surveys tab in Survey123 Connect provides the option to disable the Sent box on a by-survey basis, which may be necessary to meet security requirements or reduce storage used by the Survey123 field app. If the Sent box functionality is disabled for a survey, responses will no longer be saved on the device and the option to open the Sent box won't display for that survey.